Over the past few years, Frightened Rabbit have deservedly established themselves as the immovable face of Scottish folk music, but peak beneath the surface and you'll discover a scene that's not only extensive but also flourishing. Having done their rounds supporting Hutchinson & co back in 2010, Glasgow collective Admiral Fallow are now gaining a foothold and beginning to establish themselves as one of the most notable names in the tartan folkesphere, no mean feat given the wealth of bearded quality that the nation has to offer. With a sophomore album imminent, they're all set to cement that glowing reputation, and with a little luck could extend it beyond the realms of their homeland and morph into an internationally recognised force. 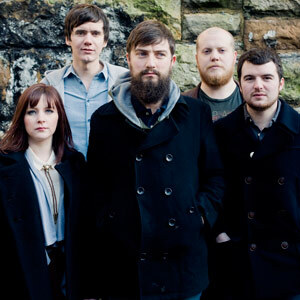 Formed in 2007 by chief songwriter Louis Abbott, the band gained momentum last year with the release of debut album Boots Met My Face, which drew praise from practically every corner. Striking an admirable balance between their traditional and modern tendencies, the record did a great job in showcasing not only their cinematic sound, but also Abbott's impressive storytelling talents, with each and every lyric uncovering detail regarding his own life. More than anything else, it was that personal touch which lifted the record above it's contemporaries, and although it left plenty of room for improvement, it marked a bold, accomplished and occasionally beautiful beginning. With follow-up Tree Bursts In Snow due next month, it'll be intriguing to hear how their sound has developed, especially given the brief wait between albums. The two tracks which have been unveiled, 'Beetle In The Box' and 'The Paper Trench' don't give much away, but do suggest a more focused approach to songwriting, with both presenting a direct and electric take on their sound. In truth they're both solid rather than spectacular, but neither should be judged conclusively until they're presented within the context of the new LP. The form that that album takes will be of great interest to those who have been following the band, and could well determine their level of future success. Tree Bursts In Snow will be released May 22. You can listen to 'Beetle In The Box' and 'The Paper Trench' here.